29th May Down Recorder Editorial supports campaign for one-way system on Edward Street, a photo by CadoganEnright on Flickr. 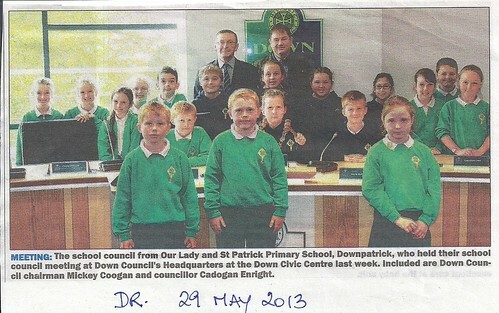 Councilor Cadogan Enright has welcomed as “long overdue” this week’s announcement by the Department of the Environment that schools, businesses and farm buildings will no longer need planning permission for solar panels. The improvements will come into operation on 30 April 2013 and follow on from permitted development rights previously introduced for the installation of domestic solar panels on homes. The changes affect microgeneration equipment like photovoltaic panels which generate electricity or solar panels that generate heat from sunlight. Business and other non-domestic properties such as schools can install micro-generation equipment up to 50kw output, including solar panels, biomass boiler housing and fuel stores and ground and water source heat pumps. Severe storms battered coastal areas in Down last week, and high winds caused damage in some areas. In Chapeltown high winds carried off a large Roads Service mirror used by local residents to ensure the main Strangford road is clear before driving out of Church Road. Councillor Cadogan Enright was contacted by concerned parents of children attending nearby St Marys in Dunsford and contacted the Roads Service about the problem. Resident Pascal Kearny finally found the mirror in a local farmyard, and Cllr Enright retuned it to the Roads Service Depot in Seaford for re-installation later this week. 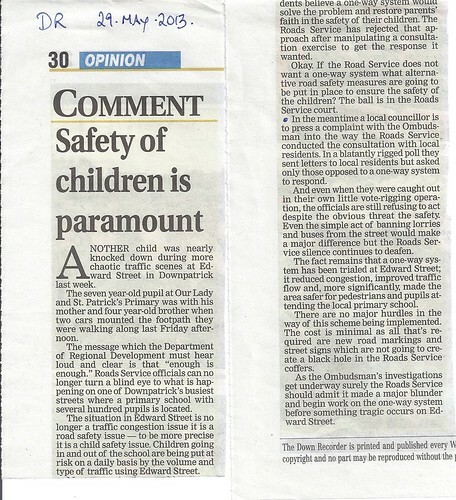 I refer to your letter dated 3 May 2013 in response to Down District Council’s letter to Permanent Secretary regarding transport matters in Down District. Your response was circulated to Councillors for their information. Council is giving consideration to the overall content of your letter along with a similar response from the Minister’s private Office however to draw a number of important matters to your attention. In your response you state local officials gave very serious attention to a proposed one-way system for Edward Street in Downpatrick. 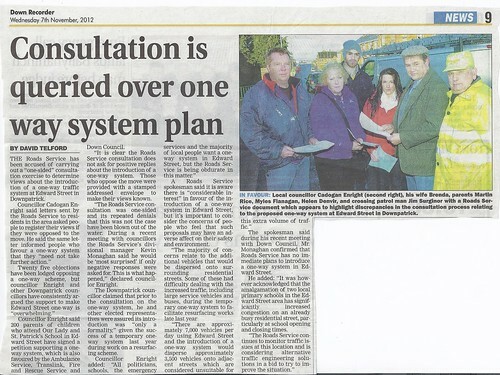 As you are aware Council objected strongly to the way in which the consultation on this scheme was organised in 2011. In particular officials were selective in compiling and assessing available evidence on supporters and objectors to the proposal. A weighted question was posed to residents which only invited comments from those opposed to the introduction of the one-way system. This ignored the many residents, public representatives and road users likely to benefit from the proposal. That consultation is now being characterised retrospectively and disingenuously as an informal consultation. I am unsure how this is meant to differ from a formal consultation except in that it fails to meet the standard of consultation normally required for such a significant proposal. Are officials empowered to substitute an informal arrangement for a formal consultation process? If this is the case, which policy document contains this discretion? Council would have concerns if TransportNI are seeking to rely on an inadequate consultation process given the impact on efforts to alleviate traffic congestion in Downpatrick town centre. I am also considering, in my private capacity raising this matter with Northern Ireland Ombudsman as an example of maladministration. I must ask you therefore to properly investigate this matter. 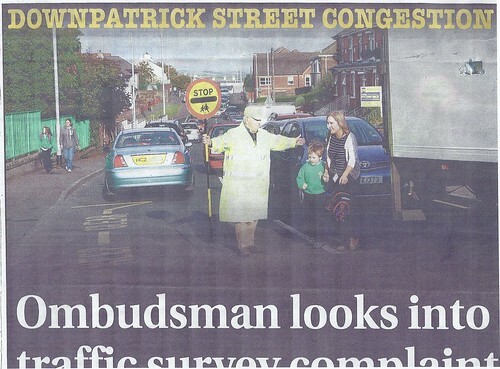 There was a clear and serious procedural failure in not conducting a proper and balanced consultation exercise on the proposal to introduce a one-way system in Edward Street Downpatrick. During the trial of the hugely successful trial of the one way system, I was one of 7 Councillors present at a meeting with the Roads Service in Down Council were we were told that no petitions or letters of support would be necessary given how overwhelmingly successful the one way system had been. We voiced our concerns at the meeting, pointing out that sending a stamped addressed envelope seeking only negative responses to every house in the area was bound to elicit a few responses. Councillors pointed out how the local population, the local councillors, the MLAs and the MP we all delighted how the trial of the one way system had worked out. We asked for the trial one-way system to be retained on a permanent basis, but Roads Service management insisted that the law required them to return to a two way system before running a consultation. We queried this as a bit of a waste of money, but were told that was the law. We were told that we should not be concerned as the success of the one way system would make any consultation a formality. I attach a copy of the consultation for your attention. Should you fail to investigate this matter and uncover the fact that the consultation fell short of what is expected in the public service, I will have to take this matter forward to the Onbudsman under the heading of maladministration. Severe storms battered coastal areas in Down in April 2013, and high winds caused damage in some areas. In Chapeltown high winds carried off a large Roads Service mirror used by local residents to ensure the main Strangford road is clear before driving out of Church Road. Councilor Cadogan Enright was contacted by concerned parents of children attending nearby St Marys in Dunsford and contacted the Roads Service about the problem. Councilor Cadogan Enright has succeeded in persuading Translink to significantly increase services to Saul and Raholp following the expiry of the current summer schedule. Cllr Enright said, “Last year local people in Raholp and Saul contacted me about how silly they felt it was that so many Translink buses by-passed the two villages along the main road to Strangford. Following meetings with local Translink management in January, I arranged to travel with them on the routes, timing different variations. We did this last month, driving the different route options between Downpatrick and Strangford. Currently only 5 of these services are routed through Raholp and Saul. The other six services by-pass the villages and head down along the main Downpatrick / Strangford Road. Both sets of buses are also timed to meet the Ferry in Strangford, and this has to be taken into account also. Following our examination of available routes, Translink conducted a detailed survey of the Strangford – Downpatrick route to see how many of the 11 buses per day can be routed through the two villages. Services have been routed along the main Road to accommodate children in getting to school in Strangford, but there are currently no children using this service along that stretch of road. Some services may have to be retained in case this changes in September. Road Service Consultation on one way system deeply flawed 7th Nov 2012, a photo by CadoganEnright on Flickr.